Hey Floralpreneur®! 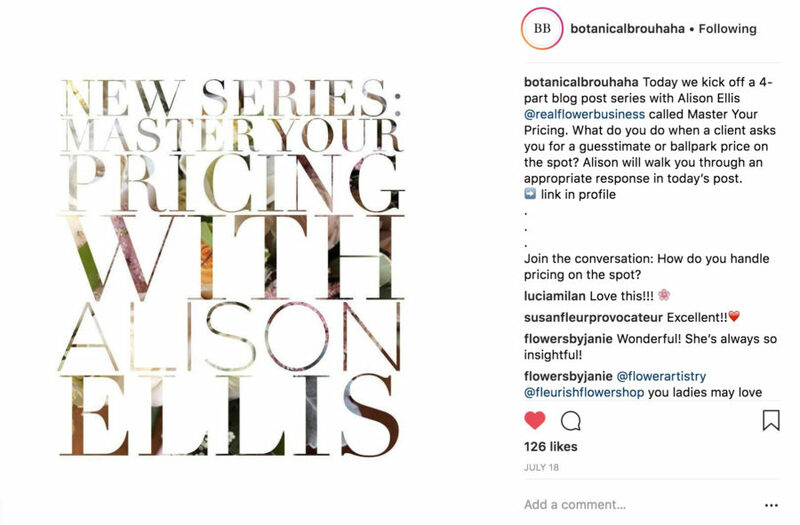 Have you seen my Master Your Pricing Series on BotanicalBrouhaha.com? It’s a 4-part series I created to help you push through some pricing obstacles and actually get results! These are pricing changes and adjustments you can easily make in your business so I hope you’ll make some time to check them out. It’s been a joy and an honor to share my Real Flower Business stuff with the Botanical Brouhaha readers. Thanks so much to Amy McGee for allowing me to guest post on her incredibly beautiful and inspiring corner of the internet. P.S. Have you checked out the Botanical Brouhaha Podcast yet? Click HERE for a link to an episode I sponsored! You’ll be glad to made the time to listen. How much can you earn as a florist? Hey, Floralpreneurs! 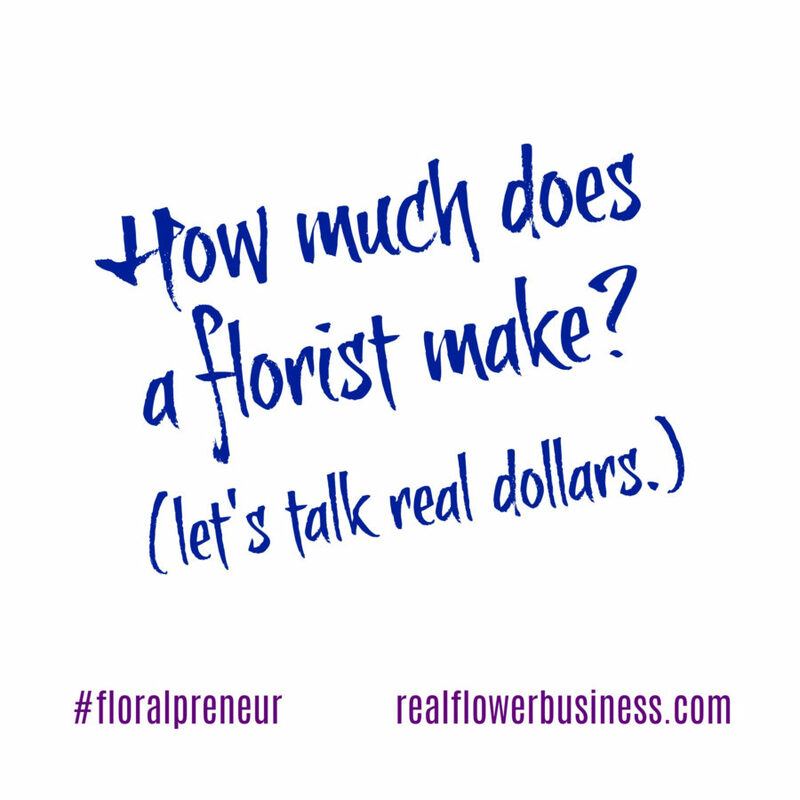 Join me LIVE on Sunday on Facebook to talk about “How much does a florist really make?” We’re going to talk real dollars and cents. What can you *really* expect to earn as a florist? After 16 years in business I can tell you a few things I’ve learned and I’ll share some feedback from florists around the world who’ve shared their personal income goals with me! You can join me LIVE on Sunday at 11am EST by clicking HERE to join my Facebook group. 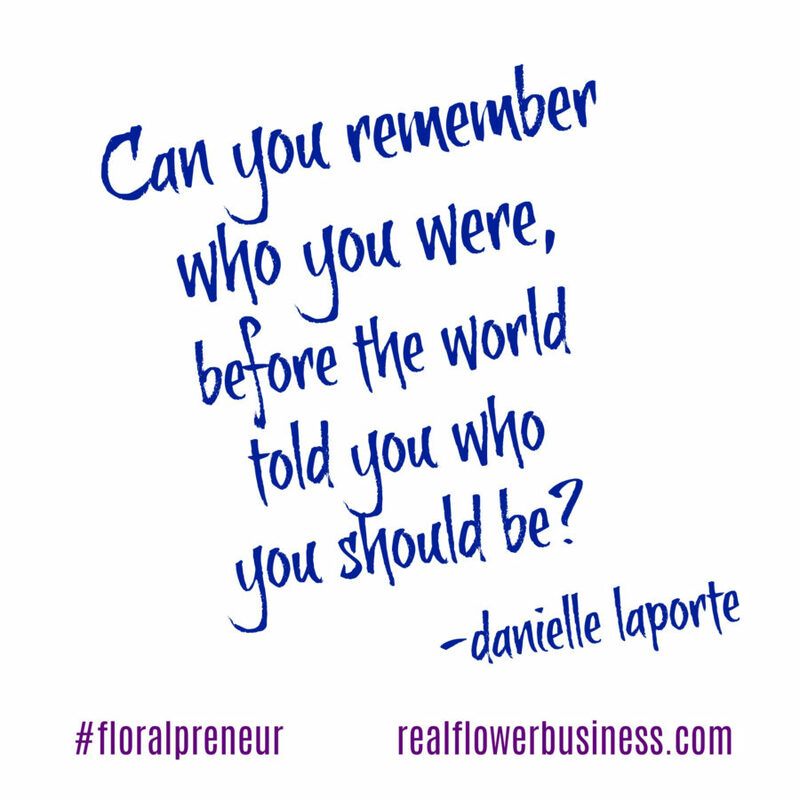 A floralpreneur® is a floral designer with initiative and business savvy. The work we do as florists isn’t always easy (and it isn’t always pretty!…there are many thorns)….but when you love this work, you take responsibility for all that comes with it….including the pressure, the stress, the unpredictability, the hours and hours on your feet, the tick-tock of the clock, the joy of creating beauty for others, and the glory when it all comes together and it’s better than they’d imagined. Keep doing beautiful work, floralpreneurs! Because while it isn’t always “easy”, when you love it, you’ve gotta put your whole heart into it. 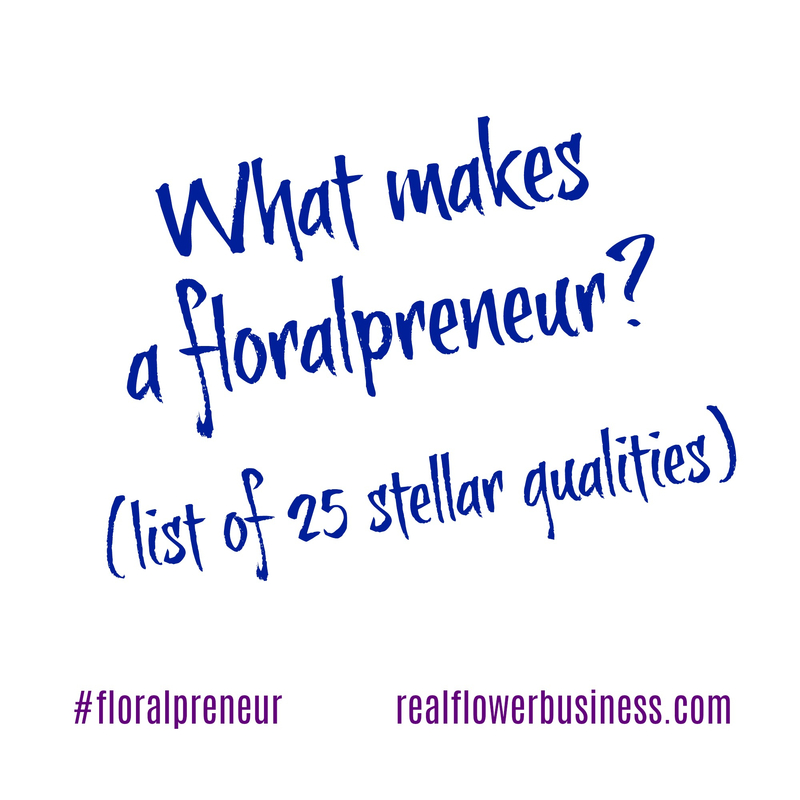 What are some other qualities of a floralpreneur? What did I miss? Leave a comment or shoot me a message any time! Have you tried a Free Course? Click here to get started! P.S. Have you check out The Vault yet? What do you need to start a floral business at home? It’s a great question and in truth, I didn’t have much when I started my business in 2002. I was about a year out of college and didn’t have a lot of money to spend or invest in a business. All I invested in was a bag for my tools, known as my “bag of tricks”, which I still use 17 seasons later (I really thought it was expensive at $50 at the time!). I didn’t have a workspace. I worked out of my 2nd story apartment with my little Subaru hatchback as a delivery vehicle. Finally, I asked my wholesaler if I could design on one of their workbenches once a week and that made my life a bit easier! Once I moved out of my apartment and into our house, I worked from our kitchen for a few years until I saved up enough to convert half of our detached garage into a studio space. Everyone’s gotta start somewhere; start before you’re ready. Clippers. Sharp and of good quality. A table. You have to have something to design on. A workbench is even better, but a table will do. Wire cutters. Clippers are for fresh stems. Wire cutters are for wire, zip ties, etc….don’t use your clippers to cut wire. Scissors. Ribbon is best cut with sharp scissors so ideally you’ll have 2 pairs of scissors; one for ribbon, one for everything else. A knife. Swiss army works for me. I do most of my cutting with a clipper, but it’s important to have a knife as well. You can use a knife to clean thorns and leaves off of rose stems even if you prefer to cut with a clipper. A few buckets. Fresh flowers need a water source so buckets are essential to proper processing. Water to fill buckets & vases. Whether you use a garden hose or a kitchen faucet or a big, beautiful sink in your shop, you’ll need a water source to get the job done. A wholesale source for flowers. Once you register your business in your state, provence, county, etc. you’ll be eligible to shop with professional wholesalers. Seek a reliable source that provides good quality. A toolbox or “bag of tricks” to bring your floral act on the road. When you have to design on-site or fix something that may have been damaged in delivery or transport, you must be prepared, so plan ahead and have a mobil toolkit. Some sort of delivery vehicle. A van, a sedan, a wagon, a box truck….I dunno….we’ve all got to start somewhere so use what you’ve got. Ideally a wagon or SUV if you’re not at the “mandatory minivan” stage in your business. Ideally, you’ll get this training in some sort of hands-on environment. I learned in flower shops. Others consider themselves “self-taught”, but there are clear do’s and don’t’s when it comes to all 3 of the above “must-knows”. You don’t need to reinvent the wheel; seek a mentor or formal training. Every year is a learning year. You’ll find online tutorials, of course, to show you how to accomplish different designs and hone your skills, and my online course, Flower Math, can teach you exactly how to price and turn a profit in your floral design business; because this is not a hobby! Once you start your business, it’s officially time to turn a profit. From day one. No need to “wait to turn a profit”. That’s not a mindset that leads to longevity in a business. Set your pricing structure properly from day 1. Continue to learn and train to gain new design techniques. Give yourself a pay increase as your skills evolve and your brand becomes sought out! I’m featured in Part 2 of the livestream which starts at about 43:00 mins. into the broadcast. Grab my 10 Tips for Home-Studio Florists HERE! 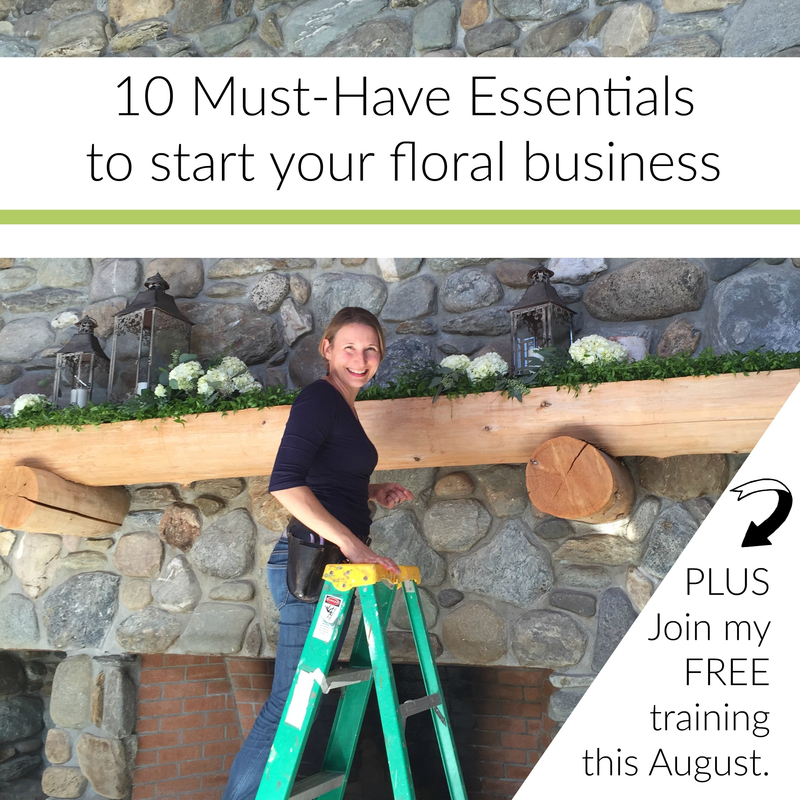 Remember: August 1st is the kick-start of my FREE training, What does it *really* take to have a floral design business! The acorn theory expresses that unique something that we carry into the world, that is particular to us, which is connected to our “daimon”. In other words, we must make our way through the layers of soil and compost and debris until the conditions are right and we’re ready to grow to our true potential. Because you were born an acorn…with everything it takes to become a huge oak right inside you. And it’s been there all along. It does take time to perfect your processes and meet (or exceed) your goals and make enough money to quit your “other job“….and the time it takes to streamline, perfect and practice can feel pretty dark some days. We’re going to spend some time in the dark before we can burst into the light! And it’s for the determined–the florists who try and try and then, try again, because there are always more layers to break through in this work to get to the light…. The florists who’ve worked slinging stems in someone else’s flower shop for a decade or two, and are finally branching out on their own…. The newly retired, newly single, new moms, new grandmas, new floristry students, basement Betty’s…. This one is for you….wherever you are on your floral journey…. Whether you’re a newly aspiring floral designer or a seasoned pro, I hope you’ll take advantage of some of my free resources, as well as my pdfs and online courses for florists. Remember you don’t have to buy anything from me to be a floralpreneur! Join us over in my free Facebook group HERE! Thanks for taking the time to read my blog today.